Associate Producer: Michael Relph; script: T. E. B. Clarke; additional dialogue: Alexander Mackendrick; original treatment: Jan Read and Ted Willis; photography: Gordon Dines; 2nd unit photography: Lionel Banes; editor: Peter Tanner; art director: Jim Morahan; musical director: Ernest Irving. Cast: Jack Warner ( P.C. Dixon ); Jimmy Hanley ( P.C. Mitchell ); Meredith Edwards ( P.C. Hughes ); Robert Flemyng ( Sergeant Roberts ); Bernard Lee ( Divisional Detective Inspector Cherry ); Dirk Bogarde ( Tom Riley ); Patric Doonan ( Spud ); Peggy Evans ( Diana Lewis ); Gladys Henson ( Mrs. Dixon ); Dora Bryan ( Maisie ); Betty Ann Davies ( Mrs. Lewis ). Awards: British Academy Award for Best Film, 1950. Balcon, Michael, Michael Balcon Presents: A Lifetime of Films , London, 1969. Clarke, T. E. B., This Is Where I Came In , London, 1974. Warner, Jack, Jack of All Trades: An Autobiography , London, 1975. Kine Weekly (London), 12 January 1950. "G.L.," in Monthly Film Bulletin (London), January-February 1950. Sight and Sound (London), April 1950. Motion Picture Herald (New York), 3 April 1950. Dickinson, Thorold, "The Work of Sir Michael Balcon at Ealing Studios," in The Year's Work in the Film 1950 , edited by Roger Manvell, London, 1951. Ellis, John, "Made in Ealing," in Screen (London), Spring 1975. Medhurst, Andy, "Dirk Bogarde," in All Our Yesterdays , edited by Charles Barr, London, 1986. Aachen, G., " The Blue Lamp ," in Reid's Film Index (New South Wales, Australia), no. 30, 1997. Charles Barr, in his definitive Ealing Studios , locates The Blue Lamp at the centre of the studio's post-war work, noting the collaboration of the writer T. E. B. Clarke, who had such an enormous impact on the comedy cycle, with the director Basil Dearden, who specialised in social dramas. Like many of the most interesting Ealing films, The Blue Lamp revolves around the confrontation of two worlds, two models of society: the stable and steady community of ordinary people, the stuff of the nation, and the hysterical and anti-social outsiders, who threaten to destroy the community, and whose threat must therefore be contained. In this particular case, the nation is embodied in the community of a local police station and its wider social network, which itself finds its most sublime expression in the domestic family life of one of the policemen, P.C. Dixon. Stability is established through the mundane routines of police work, and their communal social activities when off duty, the individual thoroughly subsumed into the collective. 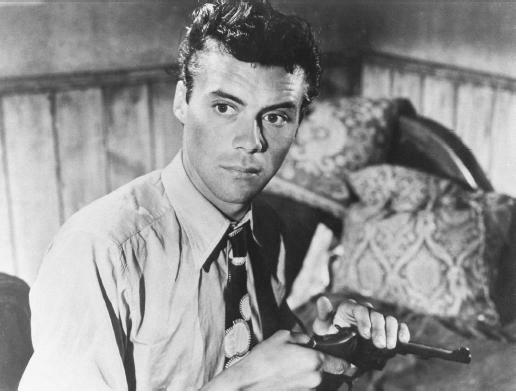 The threat comes from Riley (played by a young and gaunt Dirk Bogarde), his girlfriend, and his partner in crime, the three of them identified in a documentary-like voice-over as typical of a new post-war phenomenon, immature, improperly socialised juvenile delinquents, extreme cases, shunned by the rest of society, even by "professional criminals!" gun; by contrast, the police seem almost maternal ). This particular image of youth is eventually positively valued and narratively centralised a decade later, in films like Saturday Night and Sunday Morning , by which time television had taken over the function of articulating the principles of the national community in soap operas like Coronation Street and cop series like the equally long-running Dixon of Dock Green , featuring the same P.C. Dixon, still played by Jack Warner (even though he had been murdered half-way through The Blue Lamp !). The Blue Lamp also makes an interesting comparison with Hitchcock's crime thriller Blackmail , made some 20 years earlier, which also represents police work as routine, and the police force as a tight-knit community. But Hitchcock establishes this mundane picture of everyday life in order to subvert and unbalance it, and so to involve the spectator emotionally. As in The Blue Lamp , unconscious, repressed forces are released into the world of the everyday. But in Blackmail , the effect is to challenge the very premises of the everyday and its apparent securities and certainties. The Blue Lamp , on the other hand, establishes the ordinary in order to strengthen its moral and ideological force and the safety of routine, not to challenge it. The film thus struggles to contain disruption and reassert the ordinary: its final images neither testify to a fantastic wish-fulfilment (on the contrary, they return full-circle to the beginning, showing how the community effortlessly reproduces itself, and takes all traumas in its stride), nor leave us with Blackmail' s lingering, disturbing sense of guilt, and of the proximity of an underlying chaos, a turbulent world where anything can happen. But The Blue Lamp cannot quite so easily contain the threats, since they are visually and narratively so much more exciting for the spectator. In effect, the film interweaves two different modes of representation. On the one hand, there is the mode of social drama, heavily influenced by the documentary-realist tradition, with a characteristically loose, relatively non-dynamic, and episodic narrative, its multiplication of dramas held in check by the limits of the community. On the other hand, embedded within and foreclosed by the former, there is the much more narratively dynamic, tightly causal, uni-linear thriller, with a very different style of lighting, framing, performance, and action reminiscent of film noir: a style which eroticises the body, and vicariously engages the spectator in the pleasures of suspense and uncertainty.